Tampa (FL) Spoto athlete Eric Moate was offered by Michigan. Moate is a very productive high school running back (111 carries, 1224 yards, 14 touchdowns), but at 5’11” and 170 lbs., Michigan probably prefers him for the cornerback position. He’s a very quiet recruit and doesn’t talk much to the media. Iowa, Purdue, South Florida, West Virginia, and others have also extended offers. Tarpon Springs (FL) East Lake offensive tackle Mason Cole was offered by Michigan. He’s 6’5″, 267 lbs. and has offers from Florida State, Ohio State, and South Carolina, among others. Most of his interest seems to lie in the south, so I wouldn’t get my hopes up for him. 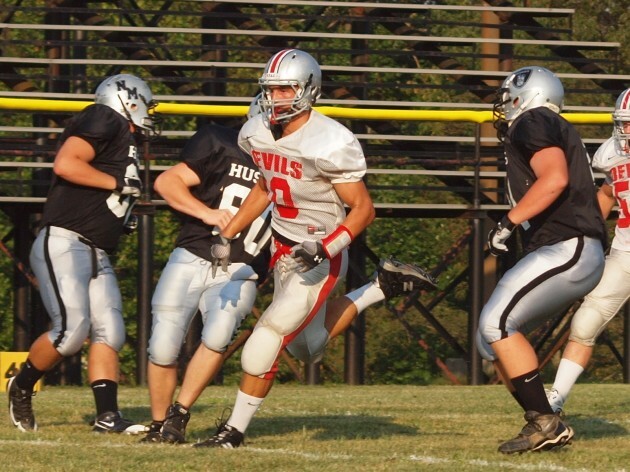 St. Clairsville (OH) St. Clairsville linebacker Michael Ferns was offered by Michigan. He’s 6’3″, 235 lbs. and has been offered by Notre Dame, Ohio State, Penn State, Stanford, and several others. As a sophomore in 2011, Ferns had 130 tackles. He also plays tight end and could play there in college. Wiley (TX) Wiley safety T’Kevian Rockwell received a Michigan offer. The 6’1″, 190 lb. defensive back already has offers from Nebraska and Virginia. 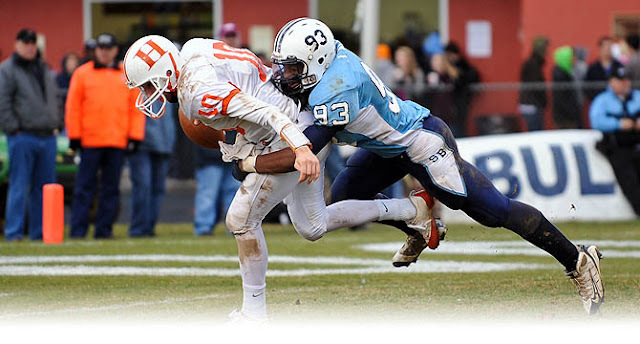 Ashburn (VA) Stone Bridge defensive end Jonathan Allen committed to Alabama. I did a scouting report on him a few months ago, and I wasn’t particularly impressed with what I saw. Wayne (NJ) Wayne Hills quarterback Kevin Olsen committed to Miami. I stopped paying much attention to Olsen a long time ago since Michigan has Shane Morris in the fold, but he does look like a capable quarterback. If you look at the list of the top quarterbacks in the country for 2013, the vast majority of them have already committed somewhere. That often seems to be the case, since once a quarterback – frequently the leader of a team – gets on board, he can start recruiting other guys. Ashburn (VA) Briar Woods linebacker Matt Rolin committed to South Carolina. Rolin never strongly considered Michigan, and the Wolverines are supposedly done with linebacker recruiting, anyway, so it’s not a significant loss. Projection: Strongside defensive end in a 4-3. Allen lacks the agility to play in space and does not display the one-on-one pass rushing ability to be a weakside end. His best fit appears to be as a strongside end, but he’ll have to add significant size and strength to hold up. Ashburn (VA) Stone Bridge DE Jonathan Allen, a 2013 prospect, received an offer from Michigan last week. Allen is 6’3″, 225 lbs. and listed as a strongside end, although I think he could fit at weakside end as well. He plays a lot like 2012 commit Mario Ojemudia, although I think Ojemudia might be a little quicker. Allen comes up too high out of his stance and doesn’t use his hands extremely well to shed blockers, but the physical talent is there to be a very good player. Boston College, Maryland, North Carolina State, Oklahoma, Virginia, and others have also extended offers. Pittsburgh (PA) Shaler Area TE J.P. Holtz was offered by Michigan, but it might be too late for the Wolverines. The 6’4″, 240-pounder has already announced a top three of Michigan State, Pitt, and Purdue. He took a recent official visit to Pitt and reportedly enjoyed it, but the coaching situation might be a negative. Holtz said that he would like to be done with visits and has yet to make it to Ann Arbor, so chances are slim that he ends up wearing a winged helmet. Regardless, Holtz is a well rounded athlete who has played running back in high school, so he has running skills that some other tight ends don’t possess. He could be an interesting pass-catching tight end to go along with the receiving skills of Devin Funchess and blocking of A.J. Williams. South Bend (IN) Washington RB David Perkins has a Michigan offer, at least according to Scout (Rivals insists he doesn’t). The 6’2″, 209 lb. athlete was committed to Notre Dame at one point, but decommitted at the end of October for reasons that are somewhat unclear. Perkins has offers from LSU, Michigan State, Missouri, Ohio State, and Tennessee, all of which he has visited or has scheduled a visit. Michigan’s coaches are recruiting Perkins for running back now that Bri’onte Dunn appears to be off the table, and Perkins has discussed trying to set up a visit to Ann Arbor for January; that would likely cause him to have to cancel a trip to Ohio State, LSU, or Tennessee. Various schools are recruiting Perkins for various positions, including running back, wide receiver, and linebacker. He has a reported 4.43 forty yard dash and a 36″ vertical leap, but he’s kind of a raw athlete and reminds me of Josh Furman in some respects. Peoria (IL) Manual OT Logan Tuley-Tillman, a 2013 prospect, was offered by Michigan last week. Tuley-Tillman is a 6’7″, 280-pounder with a nasty streak. He’s somewhat raw to be garnering such major offers, but he is a plus athlete. Unless he improves his technique and footwork significantly as a senior in high school, whichever college gets him will be getting a project. He also holds offers from Illinois, Indiana, Missouri, and Ohio State. Canton (OH) McKinley DE Se’von Pittman changed his allegiance from Michigan State to Ohio State. I can’t say that I blame him, since MSU if full of criminals. Oh, wait. So is Ohio State. Pittman’s heart never seemed to be in East Lansing, but academics were rumored to be an issue with Michigan and the impending sanctions seemed to push him away from OSU. I guess the hiring of Urban Meyer and the hope of winning a national championship was too much. If the NCAA ever gets around to sanctioning Ohio State, we’ll see if their recruiting mojo remains. Glen Ellyn (IL) Glenbard West DT Tommy Schutt jumped out of the frying pan and into the fire last week, switching his future destination from Penn State to Ohio State. I guess we’ll see in the next few years whether it was a good idea or not for Michigan to shun Schutt when he wanted to visit Ann Arbor, but my stance right now is that Schutt is going to be a load to deal with for the next several years. Meanwhile, Michigan might be a little thin on the interior. Harrisburg (PA) Bishop McDevitt DE Noah Spence committed to Ohio State on Sunday. It sure was a boon for Ohio State to get Urban Meyer as coach, because kids don’t even care that the school is about to (or, well, should) get hit with NCAA sanctions. The 6’4″, 245 lb. Spence is considered by many to be the nation’s top defensive end. Michigan was never a viable option for Spence, but for a long time, it seemed OSU was out of the running, too.